“In the Line of Fire” premieres exclusively on Investigation Discovery Channel this Sunday, May 17, at 9/8c. CLICK HERE to watch a special sneak preview. Across the United States every day, brave men and women in blue risk their lives to serve and protect all Americans. With daily headlines denouncing the negative and harmful acts of law enforcement, Investigation Discovery (ID) turns its cameras on the professionals to explore the critical role so many officers play in protecting and serving. 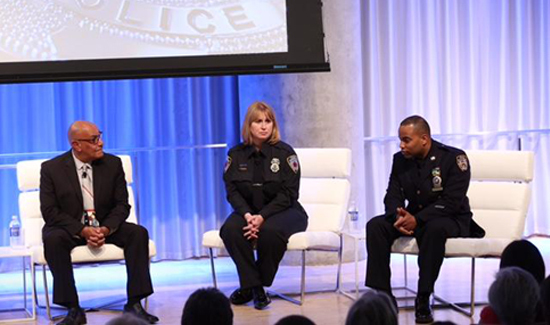 Presented by legal analyst Rikki Klieman (aka Mrs. Bill Bratton), “In the Line of Fire” brings viewers into the heat of the moment to experience the stunning split-second decisions that changed the course of events and tells, first-hand, emotional stories of survival from the police officers themselves. 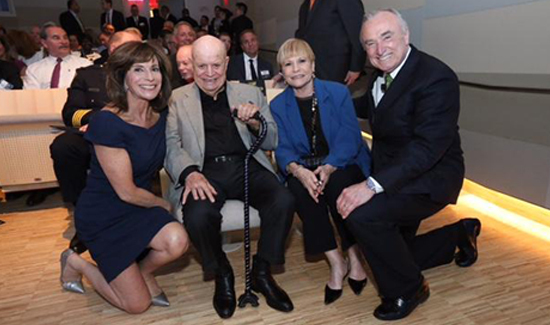 Rikki Klieman (far left) and her husband, NYPD Commissioner Bill Bratton (far right), with comedian Don Rickles. “These are the men and women in blue who answer the call to protect and serve. The overwhelming majority are decent, ethical and courageous. It is my honor to tell their stories,” said Klieman. On the night of October 24, 2012, off-duty officer Ivan Marcano was enjoying a date night with his girlfriend, Hilda Molina, in the Bronx when they witnessed three men robbing an elderly cab driver at gunpoint. Marcano immediately jumped out of the car with his gun drawn, flashing his badge to identify himself. The criminals refused to back down and fired multiple times at Marcano, as one of the bullets entered the left side of his chest, barely missing his heart. He retreated to the car as the robbers sped off in their getaway vehicle, but while en route to the hospital with Molina, came back across the criminals’ getaway vehicle that had crashed into a cab. Though nearly fatally wounded, Officer Marcano jumped out of the car and continued his pursuit on foot while applying pressure to the bleeding injury. He managed to shoot one of the suspects dead, but the other two got away. Other officers take over the investigation, finding a second suspect the following day while the third turned himself in. Marcano and Molina finally made it to the hospital, where he made a full recovery. He was later awarded the Medal of Honor, NYPD’s highest honor. On September 7, 2009, Officer Julie Olson answered a call to assist North St. Paul Officer Richard Crittenden with a domestic situation. A woman had called the police concerned that her estranged husband had returned to her apartment and may still be inside. Officers Olson and Crittenden arrived to the scene at the same time and, as they entered the complainant’s dark apartment, the suspect charged at them with a flaming rag. Officer Crittenden was struck in the face with and a struggle ensued between the suspect and two officers. The suspect was able to disarm Officer Crittenden and shoot him at point blank range, killing him instantly before turning the gun on Officer Olson. One round missed her but another hit her spare magazine, embedding shattered debris in enter her arm. Though injured, Officer Olson returned fire on the suspect, fatally wounding him, and was later awarded the Medal of Valor for going above and beyond the call of duty. On the morning of November 9, 2004, at the Mexican Consulate in Los Angeles, 19-year-old Manuel Ortiz took a pregnant Consulate employee, Dunia Gonzalez, hostage at gunpoint. At that moment, Sgt. Hector Feliciano, a 22-year veteran of the LAPD, was in the right place at the right time to witness the ensuing panic and act quickly as the first responder. Taking cover in a nearby security booth that provided access to surveillance footage from multiple security cameras on the property, Sgt. Feliciano watched as Ortiz forced Gonzalez toward the exit with a gun pressed to her back. Sgt. Feliciano then made a bold and selfless decision to leave the security booth and put himself in the line of fire, following them toward a large crowd of onlookers and repeatedly demanding the gunman drop his weapon. Finally, as the gunman became distracted by the crowd, Sgt. Feliciano saw his chance and fired a single shot, hitting Ortiz and releasing the fearful hostage. He would later receive the Medal of Valor, LAPD’s highest honor.